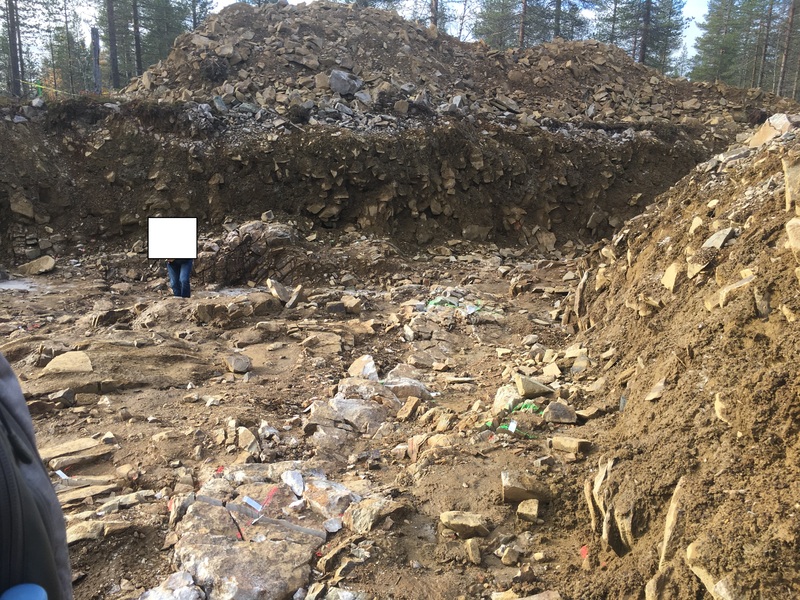 After 2.5 years of following Aurion $au I finally visited the Aurion projects myself during the company organized site visit early October 2018. It is important to note that I do not visit exploration projects often and I am no geologist, but I was impressed by the work Aurion has been doing - and so were many others who joined the visit was my impression. During my trip to Finland I was trying to find out when I started following Aurion. My first post was on May 14, 2016 and many (in hindsight almost promotional) posts would follow. It was not my intention to promote the company on CEO.ca or to try to push the share price up, but for some reason I was very convinced about this company and could not stop sharing that from the moment I started accumulating in May 2016.The reason I found out about Aurion in 2016 was that @MiningBookGuy told me about the company in a CEO.ca private channel on May 9th 2016, but he had difficulties finding information as Aurion was not the typical company with a new Corporate Presentation online every 2 weeks. I started going through all the claims Aurion staked, prepared maps to get a feel for Aurion's locations and neighbours, and called the company probably 20 times when I was finally succesfull in reaching them and had a good talk with Mike Basha. It was clear he was not a typical exploration company promotor but a dedicated geologist (and CEO) who assembled a very interesting land package and "just" optioned a project to B2Gold. After the talk I went through all information I could find and convinced myself to get a decent position. After a couple of months I made my first Vancouver conference visit in October 2016 and not many people were interested in the story and I probably sounded like a broken record about Aurion. It took another 3.5 months before Aurion announced the boulder discovery and most people know what happened with the share price after that. 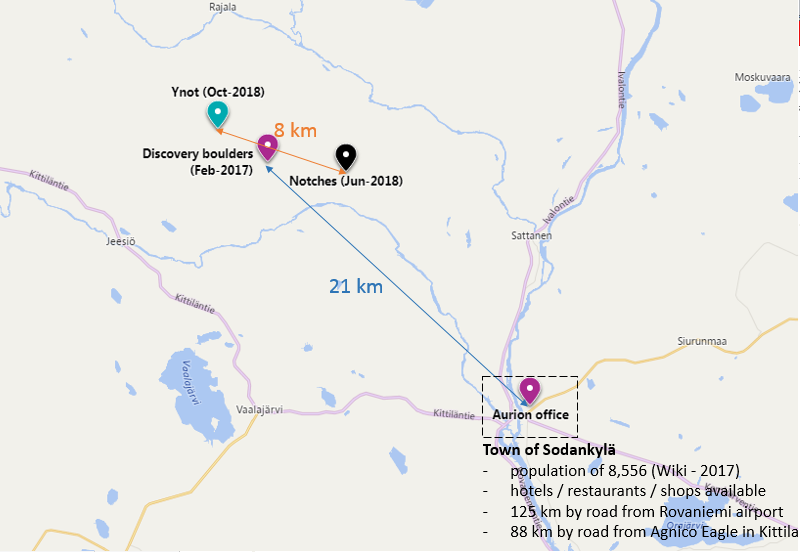 When I arrived at Rovaniemi Airport and started driving towards the town of Sodankylä I noticed the perfect condition of the roads, but there was not much traffic. I probably saw 5 or 6 cars and 1 or 2 trucks during my 1.5 hour drive. After arriving at the hotel I met with the Aurion team and all other geologist and analysts. It was the first time to meet the Aurion team and the second time to meet Dave Lotan who became Chairman in May 2017 after being a major shareholder and company supporter for quite some time. Mike Basha and Dave Lotan talked us through the latest news releases and explained the program for the site visit - followed by a good supper. Since I am not a geologist it is not my intention to write a lot about geology here. I would rather refer to the article written by Malcolmn Shaw for that. 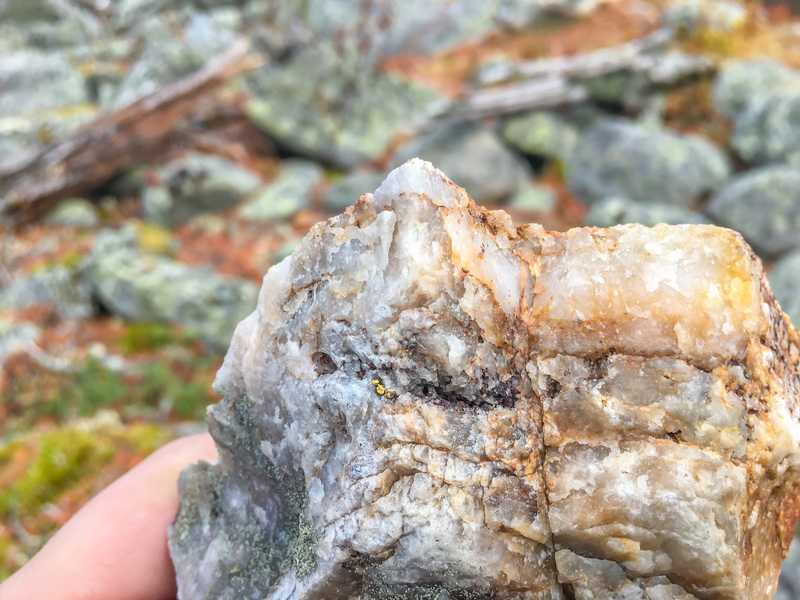 It was interesting talk to geologists of other groups who joined the site visit who explained me that seeing so much visible gold at surface is not something that you see on many projects. We went to the discovery boulder location and walked for many kilometers to see a number of the locations Aurion is active. I took some GPS measurments to get a better feel for the project scale on a (non geological) map. 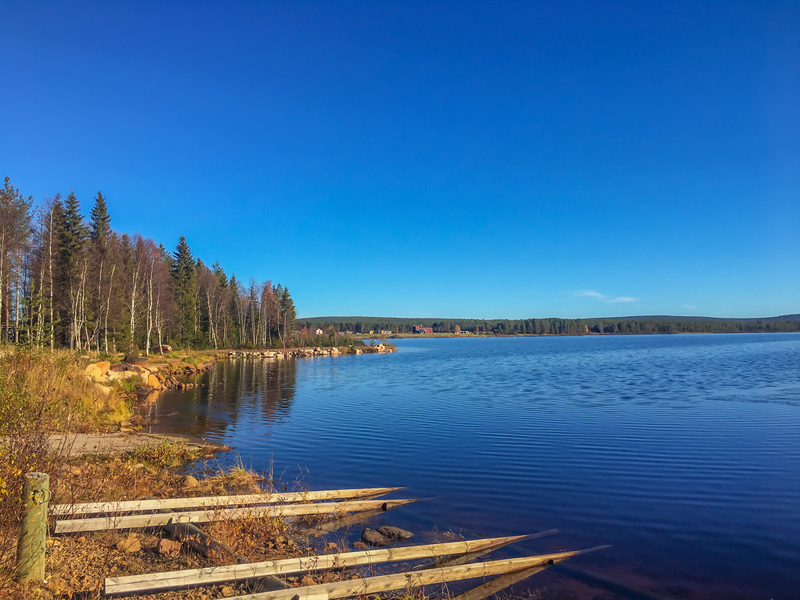 The different prospects at Risti (such as Aamurusko, Ynot, Notches) are easy to reach which makes it very cost effective to do exploration. We walked through many of the trenches. Aurion believes that trenches really helped in getting a better understanding of the system. 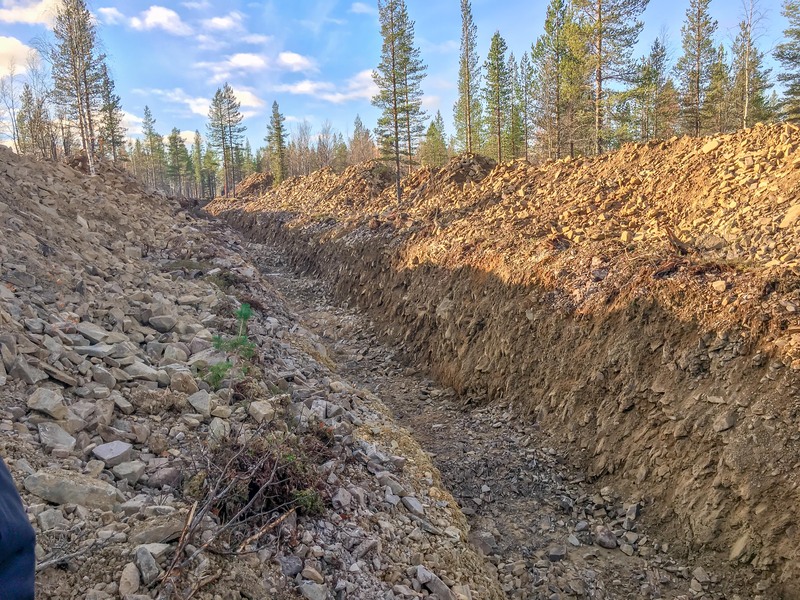 After the September drill results many people look forward to the follow up drill results and since Aurion was still drilling and trenching we will probably see a lot of news flow in the coming months. After the site visit we had a look at the Aurion office, which serves as an office, an accommodation, a storage, and a place to eat. I like the fact that Aurion keeps a very close eye at the costs, even though they had C$ 17 million working capital on June 30st. The share price action in 2017 made me decide to sell the majority of my position because it was a very significant position for me and I found it difficult at the time to make a good valuation at that point. In 2018 I was really really tempted to buy back around 75 cents but I unfortunately did not pull the trigger until I went to the site visit. I hate chasing stocks but I wanted to be invested again and therefore decided to take a decent position again after the site visit. There are still many unanswered questions, but I am convinced that IF there are economic deposits at the Risti project, Aurion will find it and in that case I have no doubt the management and directors are perfectly aligned with shareholders to create optimum shareholder value. I am probably biased because I am an Aurion shareholder again - but I have never been compensated by any company to write anything and I am not planning to write or share my opinions for compensation either.